If you’re off to see the wonderful wizard, don’t go anywhere until you’ve read our Wizard of Oz: Road to the Emerald City slot review. Powered by SG Interactive and WMS, this movie-themed spinner offers a unique combination of classic action and modern interaction. 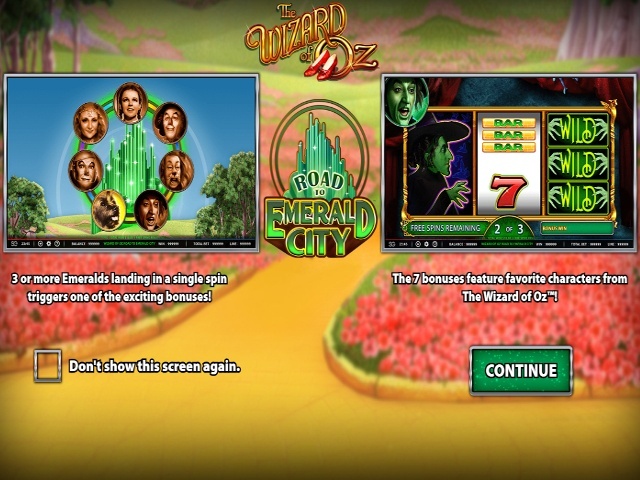 Indeed, unlike many of its peers, the Wizard of Oz: Road to the Emerald City slot game doesn’t fall into a predictable pattern. Thanks to its three-reel set up, stylishly retro looks and plethora of prizes, this classic slot is a great way to follow your own yellow brick roads towards financial prosperity. Of course, before you can set off on the right path, you need to know the basics and that’s where our Wizard of Oz: Road to the Emerald City guide will come in handy. 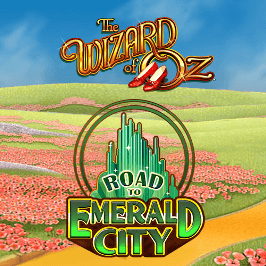 Play Wizard of Oz: Road to Emerald City Slot Demo for Free! Play Wizard of Oz: Road to Emerald City for Real Money! Unsurprisingly, this classic slot is based on The Wizard of Oz and you’ll find all the characters from the big screen spinning across your desktop or mobile screen. From Dorothy and Toto to the Tin Man, Cowardly Lion, the Wicked Witch and more, this game is almost like a virtual reunion for the cast. What’s really neat about Wizard of Oz: Road to the Emerald City slot is that the developers have captured the Technicolor look of the original movie. This means the colours have a distinct tone that’s reminiscent of the cinema vibe of the late 30s. When you combine this with a selection of bonus features that take inspiration from The Wizard of Oz, it’s fair to say this is one of the most immersive three-reel slots on the market today. Every great journey starts with a single step. To make your way along the yellow brick road to Emerald City filled with jackpots topping 10,000 credits, you need to place a bet. In this game, the three reels and nine paylines will jolt into life when you wager between 0.35 and 70 credits. Once the reels are in motion, an RTP of 96% will help you unlock a fix prize from the payout table worth at least 0.20 credits (at the lowest stakes). 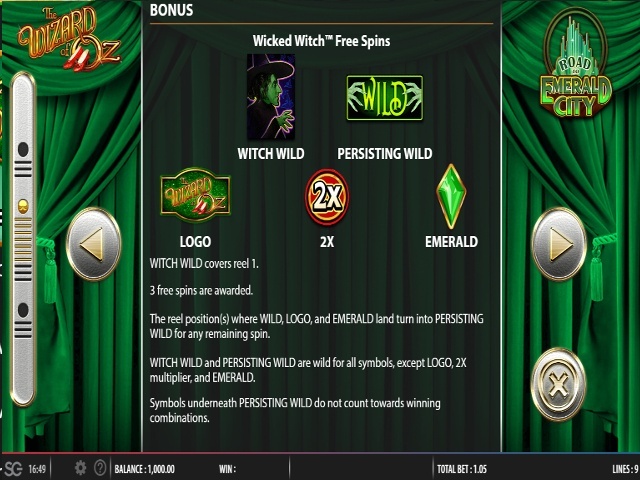 Naturally, like all top slots, the Wizard of Oz: Road to the Emerald City game features wilds, scatters and multipliers. 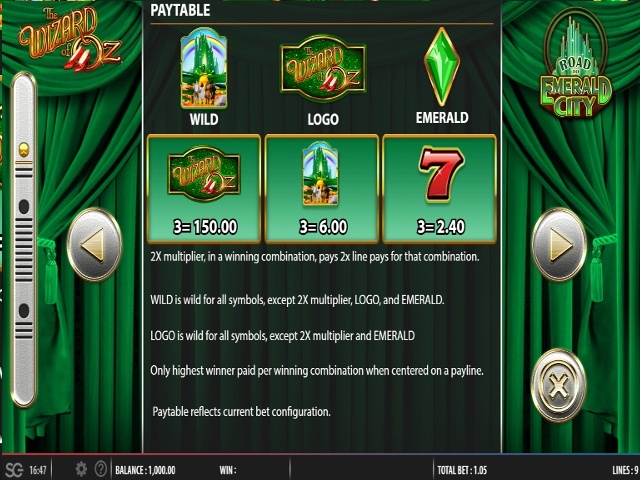 Roll in an Emerald City wild and it will substitute for any other symbol expect scatters and multipliers, while multipliers increase any wins by two. Finally, if you can uncover three or four Emerald scatters, you’ll unlock one of seven bonuses. Regardless of whether you’re playing for the max bet or at one of the lower betting limits, you can benefit from seven different bonus rounds. This variety not only helps hold your attention, but puts this game way above its peers in terms of potential payouts. If all this sounds like an adventure you want to experience, go and give Wizard of Oz: Road to the Emerald City slot a spin today. Share this Wizard of Oz: Road to Emerald City Review today! 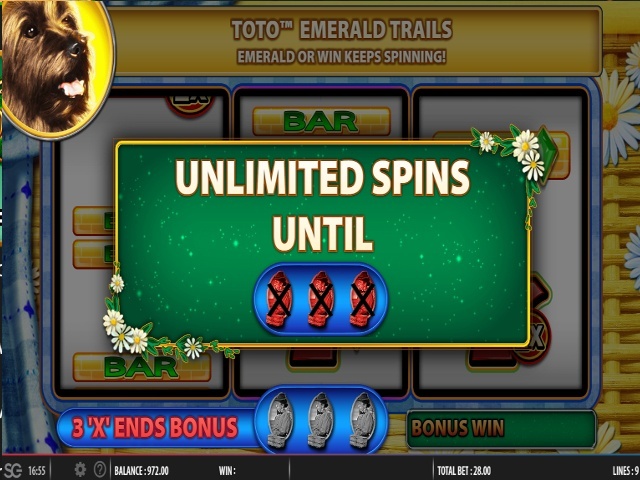 If you like Wizard of Oz: Road to Emerald City, you'll love these slot titles too!